This Thanksgiving turkey is easy to make with a coffee filter and some construction paper. I was going to spray on the food coloring, but we couldn’t find my spray bottle and just dripped some on instead. You could also moisten the coffee filter and draw on it with water-based markers such as those by Crayola. What You Need: 1 coffee filter; food coloring (or markers, etc. ); brown, red, and orange construction paper; two googly eyes; scissors; glue. How to Make It: Drip or spray food coloring onto wet coffee filter. Or, use markers. Set aside to dry on a paper towel. Cut turkey shape (kind of like a peanut) from brown construction paper. Cut out and add orange beak and red wattle. Glue on googly eyes. Once coffee filter feathers are dry, glue turkey body to it. 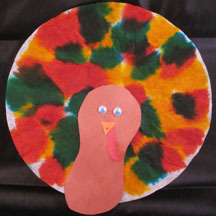 This entry was posted on Saturday, November 19th, 2011 at 8:22 pm	and is filed under animal crafts, Thanksgiving crafts. You can follow any responses to this entry through the RSS 2.0 feed. Responses are currently closed, but you can trackback from your own site.